I was trying to think of good raft systems for my DWC and saw these in my shed. Needless to say a little lightbulb went off! These modular camping mats would seem to be perfect. Cut to any size, holes that can be cut larger, cheep and they support a fair bit of weight (holding up brick ok). You could always stack two sheets to help with this. The one thing that could sink the idea is the question of toxicity. Does anyone know if these are bad? The material is Ethylene-vinyl acetate (EVA), also known as poly (ethylene-vinyl acetate) (PEVA). Or EVA rubber mats. Good question - I've seen others use them but not sure about toxicity. and I seem to recall couple more along these lines in posts where people don't want to use polystyrene. Coflute - is OK but the 5mm & 10mm stuff is generally too thin. SES use a thicker version for storm repairs which I think is 16mm? or so. But hard to get in WA and not cheap. I have used cell polycarbonate roofing and placed over the tubs. I got some of the white stuff from a salvage place - but can be pricey otherwise. So far from what I've read on these mats is that some use formaldehyde, which is a concern. However, some manufacturers don't use it and it's considered safe. Again however, their use in aquaponics is no doubt not considered. The formaldehyde dissipates over time. The other issue I noticed is how UV stable it is. No idea about that yet. Hmm more to think about. Hi all, just a quick video of my system from today. Great stuff mate. Where have you got your seedings from? I’m due to turn my system on this week and I guess I need to have some plants in it. How much powerfeed are you adding please? There are a number of posts on this forum about dosing ratios for plants. I'm actually just delving into this myself. Basically, seasol (white bottle) = good for plant roots. 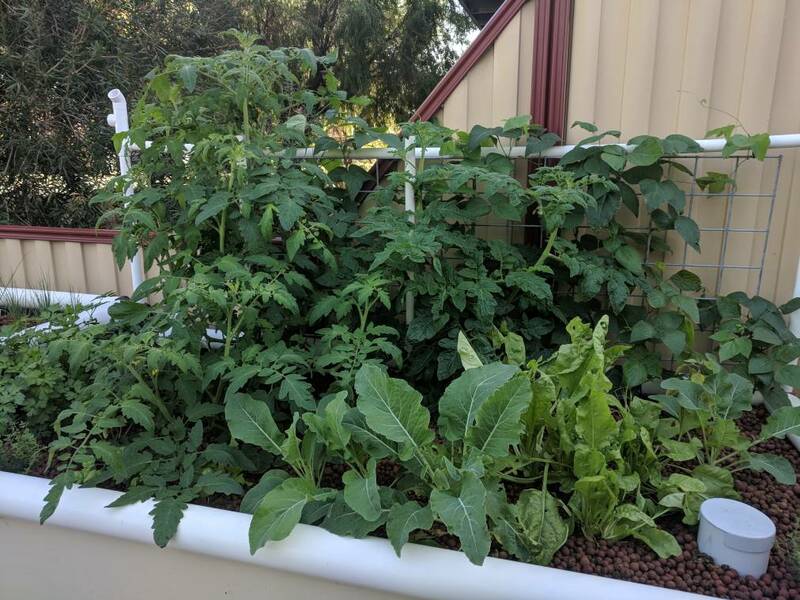 Powerfeed or maxicrop and CharlieCarp (all at Bunnings) and others you will see mentioned on the forum have more of the nutrient s your plants need for growth but you have to be a little careful with nitrogen spiking and knocking off the fish. The measurements you use depend largely on the system and harder to wrap your head around. I've started out slow and have only just started adding more of the powerfeed. 1/2 cup to the sump. I've got a total of 3000-4000L. I might do this fortnightly and maybe altnate weeks with seasol. I've also started using iron chelate, but I've bought the EDTA version, which apparently doesn't get taken up very well at pH 7 and above, which is where my system is at. I've just purchased a pH meter that I hope will be better than the dip strips I'm using. It never ends LOL. There is another chelated iron that works at a wider range, but I've forgotten it's name. Hope that helps. Hi mate, I just brought myself a pH/temp pen also HM brand seems ok what brand is yours? Quick and easy to check too. How’s the system going. Sorry, missed this one. Not sure what brand my pen is, but it seems to read well. I made up a pH 6.8 solution at work (tested on our good pH probe), which is the pH recommended to calibrate the pen. It was more or less bang on. I tested my system and it's reading 7.6, so on the high side, but I'm not going to muck with it. Plants are going gangbusters. Trout growing really well. Can't wait until summer to really see how the tomatoes grow. My two plants are huge, only one fruit though. Lots of flowers, no fruit. >> I tested my system and it's reading 7.6, so on the high side, but I'm not going to muck with it. 7.6 is a good place to be. Definitely don't touch it. I’d be rapt with 7.6 as mines around 8-8.2 and I might acid it down a little tomorrow just to hav a little ammonia buffer for the trout I want to get on Monday. I’ll aim for 7.6 ish if I can. >>7.6 is a good place to be. Definitely don't touch it. Yeah, I'm pretty happy with it. It's likely going to go higher eventually once the CaCO3 powder I added is diluted out. Think it's pretty well buffered for now. Probably best to post this in the general discussion page under a thread like fish stocking density. Also, you need more information. Unfortunately it's not as simple as how much water volume you have. 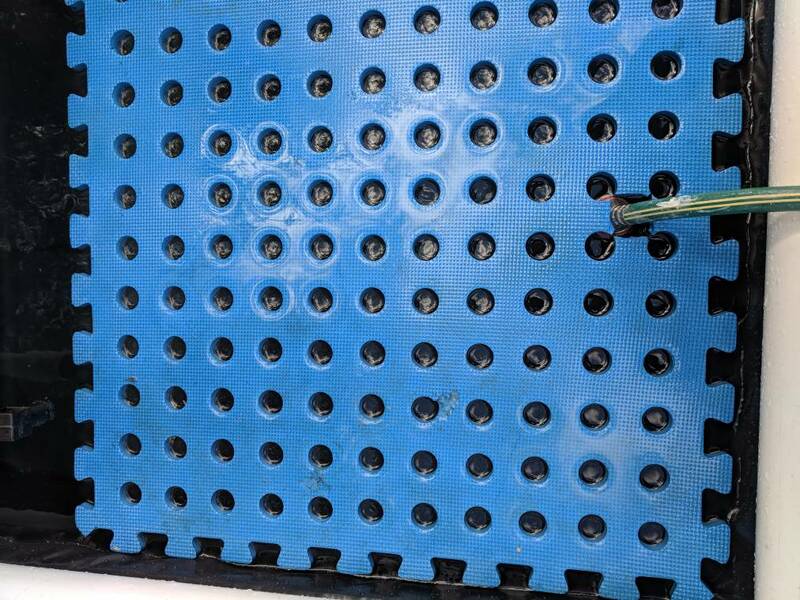 It depends on your system, especially the size/type of filtration you have to remove the waste. Also, this is an aquaponics forum, so not sure what you mean by "pond" . If you are not growing vegetables etc then another forum might be better. We don't have tilapia in Australia that I know of, at least not in WA as they are a pest species, so I can't help you there. Have a look at RobBob's vids on you tube and watch his vid on "how many fish? 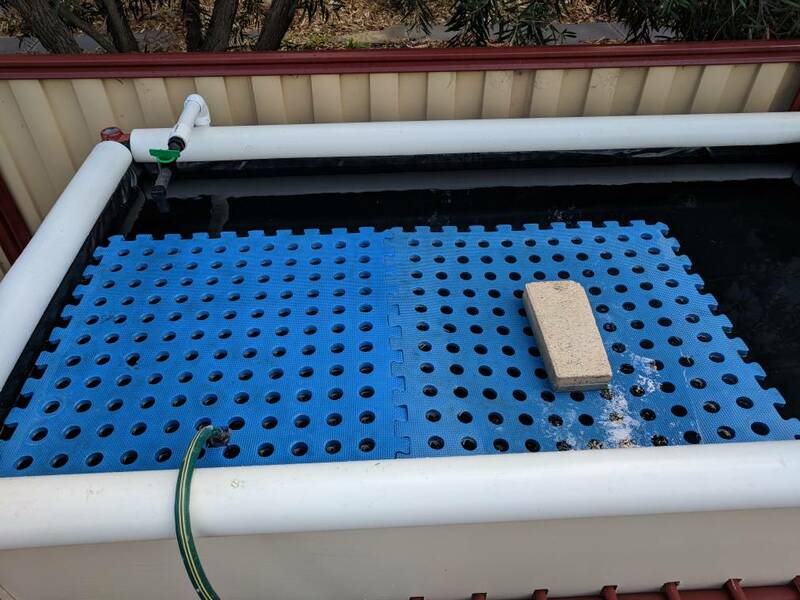 Aquaponics 101". 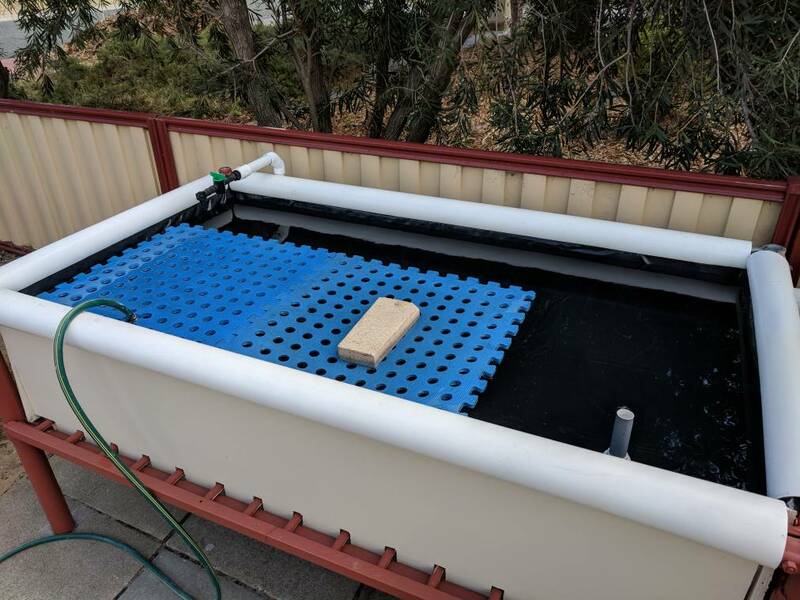 His website should help you with most of your journey into Aquaponics.